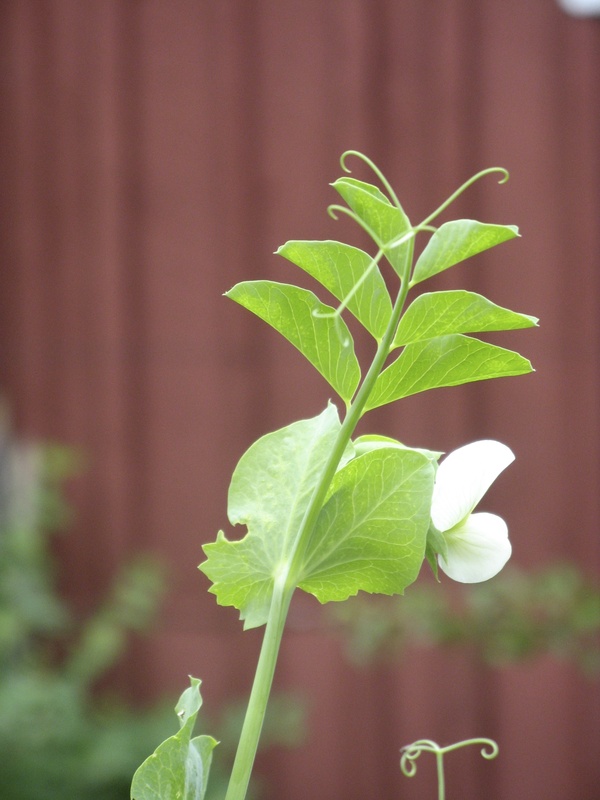 Every stage of a pea’s life is pretty to look at — just as every part of the pea itself is delicious to eat. A few years ago I began to notice recipes incorporating “pea shoots” in their ingredients — or as a garnish. 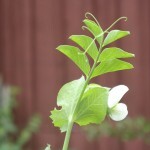 These are the tender leaves and tendrils of the growing plant. Used raw, in a green salad or as garnish, they add a sweet pungent kick to any dish. Sauteed — in a stir fry, for instance — they hold their shape and flavor beautifully. 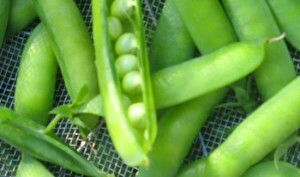 I like to add raw shoots to a saute of fresh (or frozen) sugar snap peas, peas, and asparagus cut into one-inch pieces. Just reheat, stir in plenty of fresh butter, salt and pepper — and perhaps a sprinkling of parmesan— and you have a delicious and very nutritious (pea shoots are packed full of antioxidants that help protect against certain diseases) accompaniment for chicken or salmon. This past weekend, with an abundance of peas — in all stages of growth — on my hands, and a Cordon Bleu-trained friend and his wife coming for Sunday lunch, I decided to see how my humble peas would comport themselves in a more gourmet setting. The day before I prepared a chilled pea soup that I found on the internet made with fresh peas and chicken stock, fresh ginger, garlic, shallots. It was simple, fast, and when served the next day with a squeeze of fresh lemon, a dash of plain yogurt, and a garnish of lemon basil, a real hit with everyone. For the main course I prepared one of my all-time favorite summer dishes—Cajun Shrimp and Corn Salad (recipe below adapted from Food & Wine). What a great and unique combination of tastes and textures: crusty, warm shrimp (to keep it simple, I used my grill pan), sweet corn kernels, cilantro, chopped dates, lime juice, and pea shoots. The Food and Wine recipe calls for a pickled red onion component which I think is really more work than necessary (just add a tablespoon or raw or sauteed shallots). On the other hand, on really hot summer days most cooking seems to be more work than necessary. Peas come in their own edible packaging: just pry open the pod and pop a handful of sweet, crunchy peas right into your mouth. They make a great snack — for anyone of any age. Light a grill or heat a grill pan. In a large bowl, mix the Old Bay, Cajun spice, smoked paprika, rosemary, cayenne and 1 tablespoon of the olive oil. Add the shrimp and toss well. Grill the shrimp over high heat, turning once, until the shrimp are lightly charred and white throughout, about 2 minutes. Rub the corn with the butter and season with salt and black pepper. Grill over moderately high heat, turning occasionally, until the kernels are charred and tender, about 10 minutes. Let the ears cool slightly. Using a serrated knife, cut the kernels from the ears over a large bowl. Toss the corn with the cucumbers, dates, cilantro, lime juice and the remaining 1 tablespoon of olive oil. Top with the grilled shrimp, garnish with the pea shoots and serve.